NEW YORK — Adjusting to being a caregiver is challenging enough for new parents, even before you add the complexities that come with being a gay parent. Peter Parnell, recently author of the book for “On A Clear Day You Can See Forever” on Broadway, is also a screenwriter, and has written a tender domestic comedy called “Dada Woof Papa Hot” about the joys and trials of being a gay father in contemporary New York City. Staged with smooth economy by Scott Ellis, a pleasing production opened Monday night off-Broadway at Lincoln Center’s thrust-stage Mitzi Newhouse Theater. Gay and straight parents exchange confidences and advice about raising their young children, and we see the results on their relationships and sense of self as they evolve over a year. There is plenty of frank dialogue about sexuality, too, amid the parenting- and relationship-related conversations. 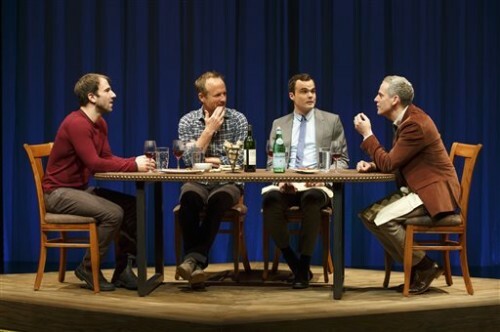 Patrick Breen and John Benjamin Hickey play a married pair of middle-aged dads, whose still-loving relationship has naturally altered since the arrival of their now 4-year-old daughter Nikki in similar ways to those experienced by straight parents. Breen wears a confident, loving air as psychologist Rob, who absolutely adores fatherhood, while Hickey makes insecure Alan into a likeable mope. Annoyed that he’s apparently less-favored by Nikki than Rob is, Alan reminds Rob that he didn’t really want to have a child and reminisces about the days when they did a lot of traveling. They make friends and compare notes with a pair of dads in their mid-30s, portrayed by Stephen Plunkett and Alex Hurt. Hurt, whose character Jason is a carefree throwback to sexually promiscuous gay men, at times seems a little uncomfortable in his role. Jason’s promiscuity also seems to be at odds with everyone else’s apparent domesticity, although a few other possible infidelities creep into the story.